Electronic Arts' Need for Speed series continues to lead the exotic car-racing pack in its fourth incarnation, Need for Speed: High Stakes. 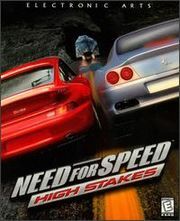 Though graphically similar to the previous version (Need for Speed III), High Stakes innovates with new race tracks, visible car damage, and a career mode that should please racing fans. This page was last modified on 4 December 2009, at 09:44. This page has been accessed 193,562 times.